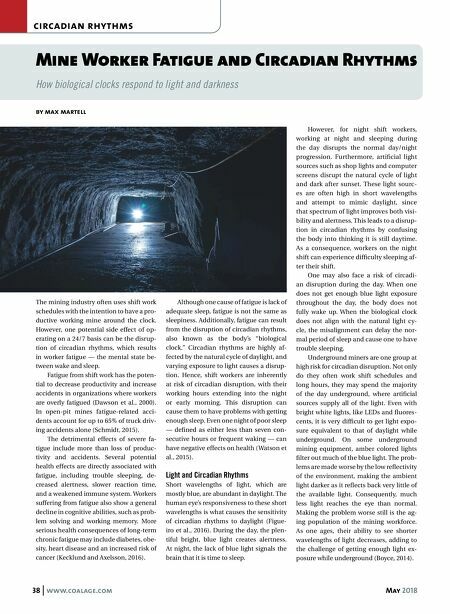 38 www.coalage.com May 2018 circadian rhythms Mine Worker Fatigue and Circadian Rhythms How biological clocks respond to light and darkness by max martell The mining industry often uses shift work schedules with the intention to have a pro- ductive working mine around the clock. However, one potential side effect of op- erating on a 24/7 basis can be the disrup- tion of circadian rhythms, which results in worker fatigue — the mental state be- tween wake and sleep. Fatigue from shift work has the poten- tial to decrease productivity and increase accidents in organizations where workers are overly fatigued (Dawson et al., 2000). In open-pit mines fatigue-related acci- dents account for up to 65% of truck driv- ing accidents alone (Schmidt, 2015). The detrimental effects of severe fa- tigue include more than loss of produc- tivity and accidents. 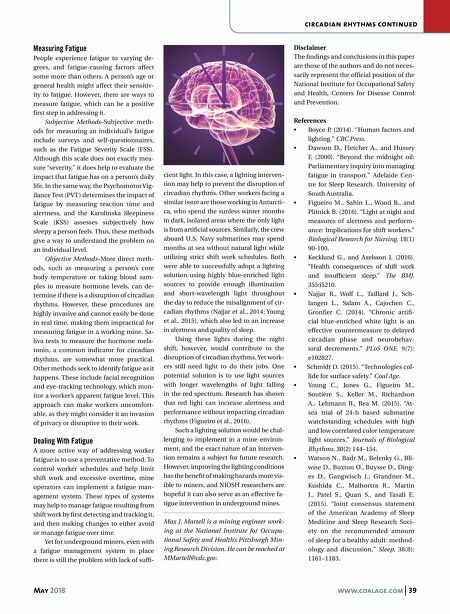 Several potential health effects are directly associated with fatigue, including trouble sleeping, de- creased alertness, slower reaction time, and a weakened immune system. Workers suffering from fatigue also show a general decline in cognitive abilities, such as prob- lem solving and working memory. More serious health consequences of long-term chronic fatigue may include diabetes, obe- sity, heart disease and an increased risk of cancer (Kecklund and Axelsson, 2016). Although one cause of fatigue is lack of adequate sleep, fatigue is not the same as sleepiness. Additionally, fatigue can result from the disruption of circadian rhythms, also known as the body's "biological clock." Circadian rhythms are highly af- fected by the natural cycle of daylight, and varying exposure to light causes a disrup- tion. Hence, shift workers are inherently at risk of circadian disruption, with their working hours extending into the night or early morning. This disruption can cause them to have problems with getting enough sleep. Even one night of poor sleep — defined as either less than seven con- secutive hours or frequent waking — can have negative effects on health (Watson et al., 2015). Light and Circadian Rhythms Short wavelengths of light, which are mostly blue, are abundant in daylight. The human eye's responsiveness to these short wavelengths is what causes the sensitivity of circadian rhythms to daylight (Figue- iro et al., 2016). During the day, the plen- tiful bright, blue light creates alertness. At night, the lack of blue light signals the brain that it is time to sleep. However, for night shift workers, working at night and sleeping during the day disrupts the normal day/night progression. Furthermore, artificial light sources such as shop lights and computer screens disrupt the natural cycle of light and dark after sunset. These light sourc- es are often high in short wavelengths and attempt to mimic daylight, since that spectrum of light improves both visi- bility and alertness. This leads to a disrup- tion in circadian rhythms by confusing the body into thinking it is still daytime. As a consequence, workers on the night shift can experience difficulty sleeping af- ter their shift. One may also face a risk of circadi- an disruption during the day. When one does not get enough blue light exposure throughout the day, the body does not fully wake up. When the biological clock does not align with the natural light cy- cle, the misalignment can delay the nor- mal period of sleep and cause one to have trouble sleeping. Underground miners are one group at high risk for circadian disruption. Not only do they often work shift schedules and long hours, they may spend the majority of the day underground, where artificial sources supply all of the light. Even with bright white lights, like LEDs and fluores- cents, it is very difficult to get light expo- sure equivalent to that of daylight while underground. On some underground mining equipment, amber colored lights filter out much of the blue light. The prob- lems are made worse by the low reflectivity of the environment, making the ambient light darker as it reflects back very little of the available light. Consequently, much less light reaches the eye than normal. Making the problem worse still is the ag- ing population of the mining workforce. As one ages, their ability to see shorter wavelengths of light decreases, adding to the challenge of getting enough light ex- posure while underground (Boyce, 2014).